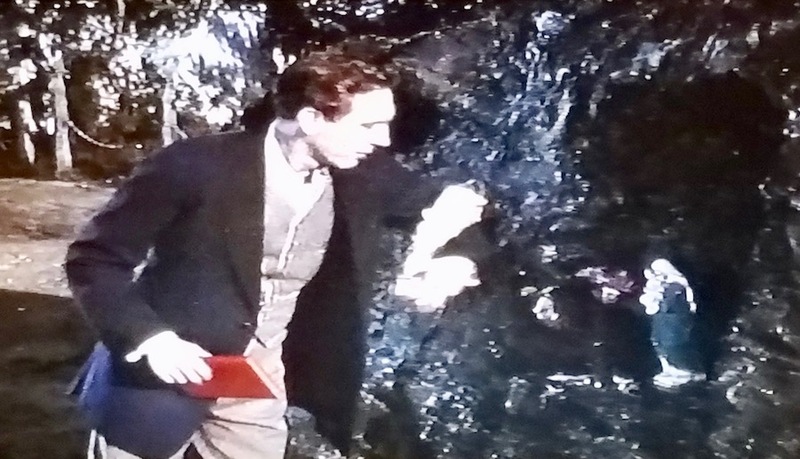 I have done a few “first impressions” series of posts over the years, which focus on more current films that I have watched in theaters that include reel librarians and/or library or archives scenes. The resulting “first impressions” posts are necessarily less detailed, as I don’t have the luxury of rewatching scenes and taking notes, but they turn out to be some of my more consistently popular posts. A little over a month ago, I was able to watch Spike Lee’s latest film, BlacKkKlansman, at The Grand Cinema, which is an awesome, independent, arthouse-type movie theater in Tacoma. The film is based on the 2014 memoir Black Klansman by Ron Stallworth, and John David Washington (the son of Denzel Washington and Pauletta Washington) is perfectly cast in the title role. In the early 1970s, Stallworth is hired as the first black officer in the Colorado Springs, Colorado police department. Initially assigned to work in the records room, he requests a transfer to go undercover and gets reassigned to the intelligence division. While reading the newspaper, he finds an advertisement to join the Ku Klux Klan. He calls and pretends to be a white man, and eventually becomes a member of the Colorado Springs chapter. Flip Zimmerman (Adam Driver) acts as Stallworth in order to meet the KKK members in person. This is a film that punches you in the gut, and keeps you thinking and feeling and reacting. It is VERY timely. Highly recommended. So what does this film have to do with reel librarians? As mentioned in the summary above, Stallworth is initially assigned to work in the records room. 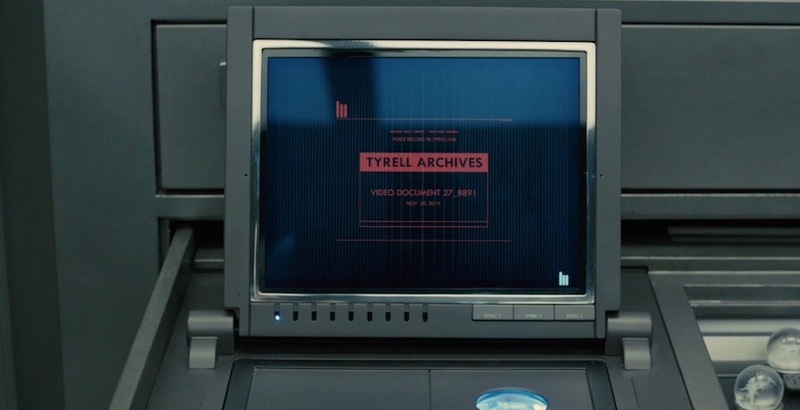 There is a small nameplate on the front of the shelving units that says “Records librarian” (which is visible in the screenshot below), although the records room is essentially the archives of the police department. Stallworth is really bored working in the records room, and it’s clear that the records room is like a “right of passage” for rookie cops. It’s not a prestigious job, and the “real” cops look down on their co-workers stuck behind the desk. Don’t mess with records librarians! We also see another records room officer, played by Jeremy J. Nelson, in one of the records room scenes. There is also a very brief scene — perhaps two-thirds of the way through the movie? — where the president of the Black Student Union (Laura Harrier as Patrice Dumas) goes to what looks to be an academic library and looks up microfiche. In that brief library research scene, you can catch a glimpse of a reel librarian, played by Elise Hudson, who helps set up the microfiche machine for Patrice. Patrice is researching materials and photos for an upcoming speaker (Harry Belafonte as Jerome Turner), and in a later scene featuring Turner’s moving speech, you see the archival photos she found and used displayed around him. Reflecting on BlacKkKlansman, I realized that this film falls into the Class II category, films in which the protagonist or other major characters are librarians, but the librarian’s occupation does not directly affect the plot. This is because John Stallworth, the lead character, worked as a “records librarian” — but more accurately, the records archivist. 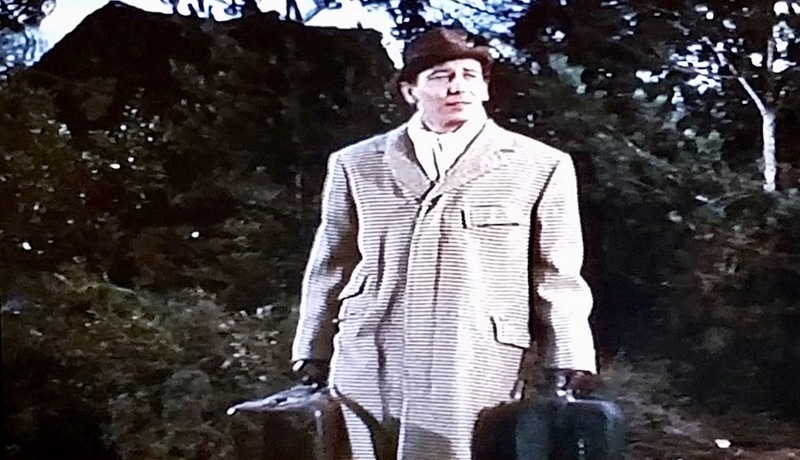 I would say his character reflects the “Liberated Librarian” character type pretty well, as he is literally liberated from the Records Room and promoted into the intelligence division. 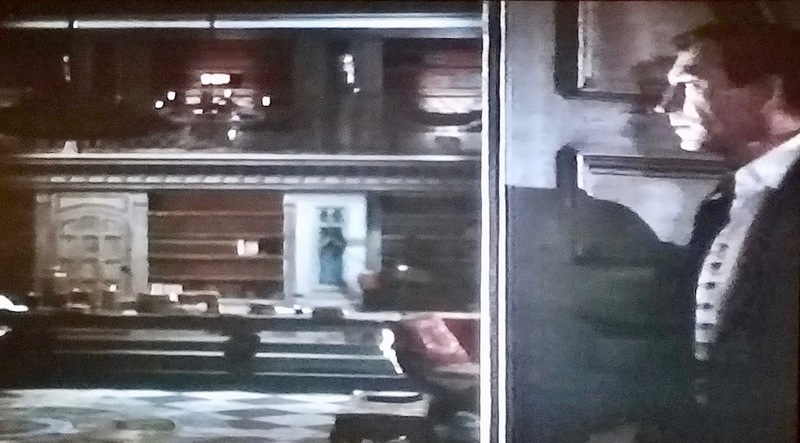 There are two other reel librarians/archivists in the film as well, Jeremy J. Nelson as another Records Room Officer and Elise Hudson as a (more traditional) librarian, although we only see them collectively for a few seconds on screen. They function as your basic Information Providers, there to establish the library/archives settings of specific scenes. Want more “first impressions” posts? BlacKkKlansman. Dir. Spike Lee. Perf. John David Washington, Adam Driver, Laura Harrier. Focus Features, 2018. Based on the 2014 memoir Black Klansman by Ron Stallworth. “BlacKkKlansman” via Wikipedia is licensed under a CC BY SA 3.0 license. As per the winning entry in the most recent reader poll, this week I am analyzing Horror of Dracula (1958)! The first in the series of Hammer horror films starring Christopher Lee as Count Dracula, Horror of Draculawas a critical and commercial success when it was first released in 1958 — and it has remained a go-to classic ever since. The film was directed by Terence Fisher and clocks in at a brisk 82 minutes long. This film adaptation differs in several ways from Bram Stoker’s original and groundbreaking source novel. I will not take time out here to enumerate those differences; for a list of them, visit the film’s IMDb.com trivia page. The broad strokes of the main storyline remain relatively intact, however, so I will also not go into detail about the plot. I am also assuming that the reader is familiar with the basic storyline of Dracula and characters like Harker, Lucy, Van Helsing, and Arthur Holmwood. The Diary of Jonathan Harker. The 3rd of May, 1885. At last, my long journey is drawing to its close. What the eventual end, I cannot foresee. But whatever may happen, I may rest secure that I have done all in my power to achieve success. […] I deemed myself lucky to have secured this post and did not intend to falter in my purpose. Right away, it’s clear that Harker is on a mission. 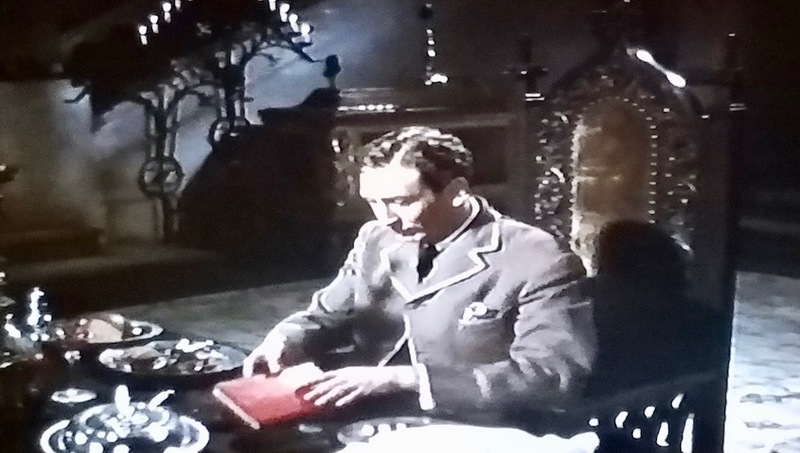 While Harker eats dinner in the castle and waits for Dracula, he takes out a couple of books from his case. The slim volume with the red cover is Harker’s diary — we will see that volume several times throughout the film. In fact, that diary is so important and onscreen so frequently it’s kind of a wonder the film wasn’t retitled The Diary of Jonathan Harker! A beautiful but mysterious woman enters the room. Harker hastens to introduce himself. My name’s Jonathan Harker. I’m the new librarian. What I found intriguing about this line is that this is TOTALLY what a (real) librarian *would* say, but Harker says this line in a completely different context than how a librarian would mean it while at, say, a reference desk. Harker says this in response to the lady’s distress, who is insistent that she is being kept in the castle against her will. 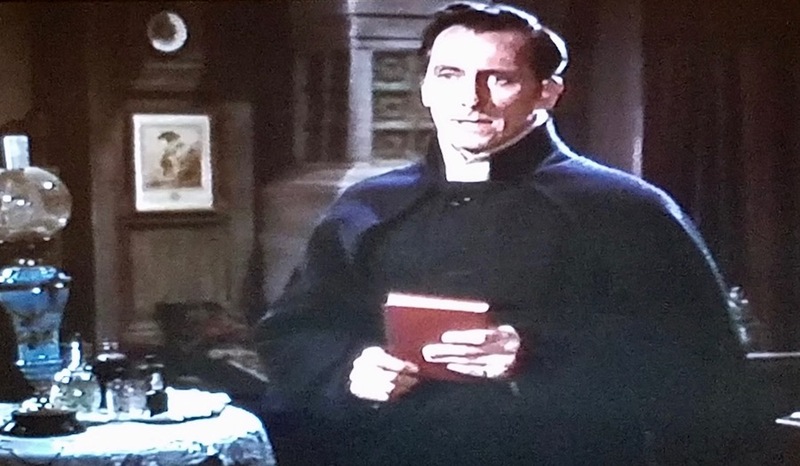 Dracula and Harker then “meet cute,” and Harker puts away his diary. These next exchanges between Dracula and Harker constitute the bulk of the context of Harker’s position as the librarian. They continue talking as Dracula shows him up the stairs to his room, when Dracula references his private library collection. Harker: How soon may I start work, sir? Dracula: As soon as you wish. There are a very large number of volumes to be indexed. When they get into his room, Dracula reveals Harker’s qualifications to be engaged as his private librarian. Dracula: I consider myself fortunate to have found such a distinguished scholar to act as my librarian. Harker: I like quiet and seclusion. This house, I think, offers that. Dracula: Then we are both satisfied. An admirable arrangement. Dracula then leaves. 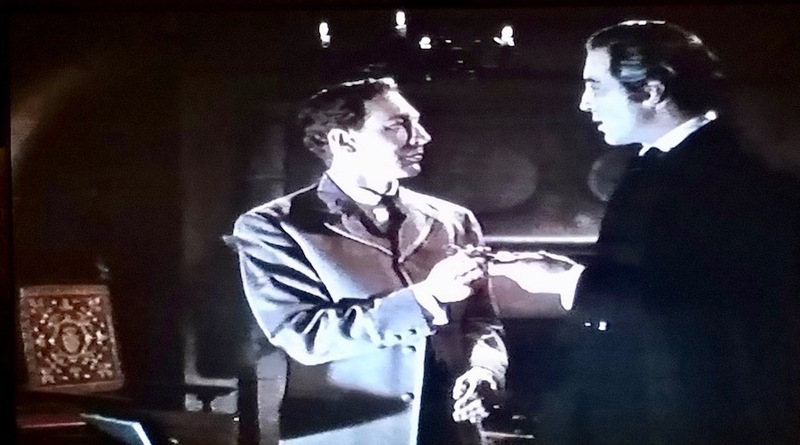 But after Harker unpacks a few things, Dracula comes back into the room and gives him a key. 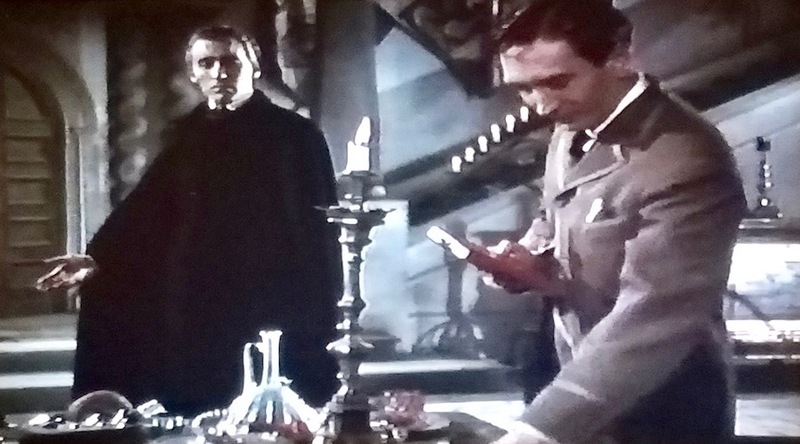 Dracula: As I shall be away so long, I think it’s better that you have a key to the library, Mr. Harker. You will find the library to the left of the hall. The key to the library! Harker then sits down to write in his diary, and he reveals to the audience the specifics of his mission — and his subterfuge! At last, I have met Count Dracula. He accepts me as a man who has agreed to work among his books, as I intended. It only remains for me now to await the daylight hours, when with God’s help, I will forever end this man’s reign of terror. Ending at less than 15 minutes, this is quite an efficient opening sequence. Harker dozes off in a chair by the fire and awakes when he hears his door knob start to turn. He goes downstairs and into the library, the room opposite the main dining hall. It’s our first peek at the library, and considering what we had heard Dracula say before (“There are a very large number of volumes to be indexed“), the first impression is… underwhelming. There look to be only a few rows of bookshelves along the back wall. 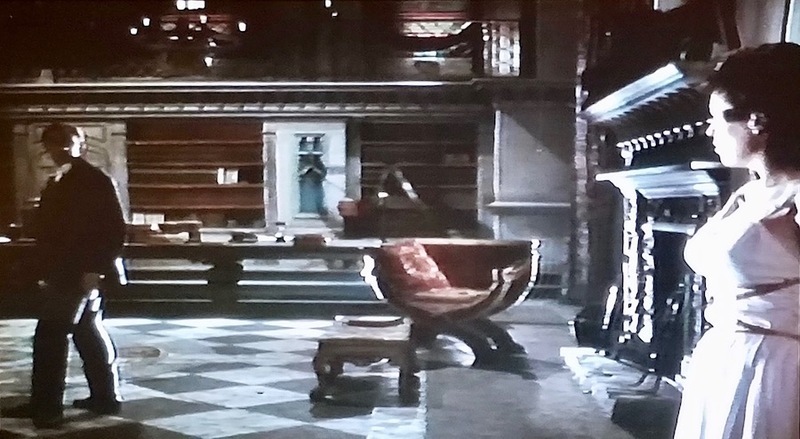 I think the fireplace in this set may be larger than Dracula’s private library! As Harker enters the room, he is startled to find the mysterious woman behind him. 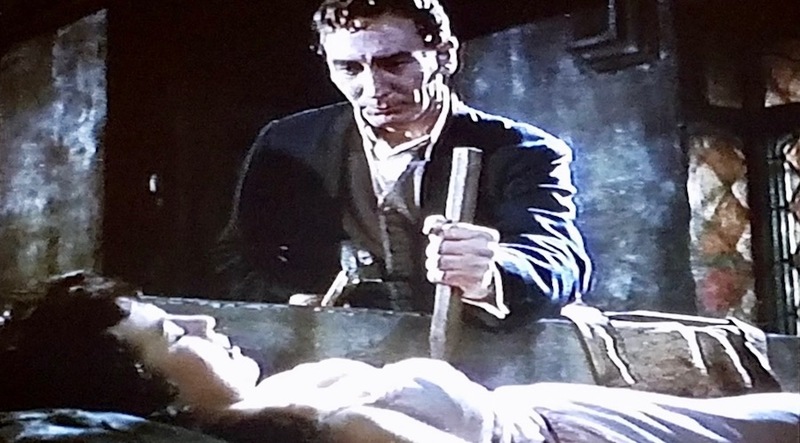 Once again, she pleads with him to help her escape Dracula… and of course she turns out to be a vampire! (The three brides of Dracula in the novel are condensed into this sole role.) After she bites his neck, Harker pushes her away as Dracula rushes in through a door in the middle of the bookshelves. 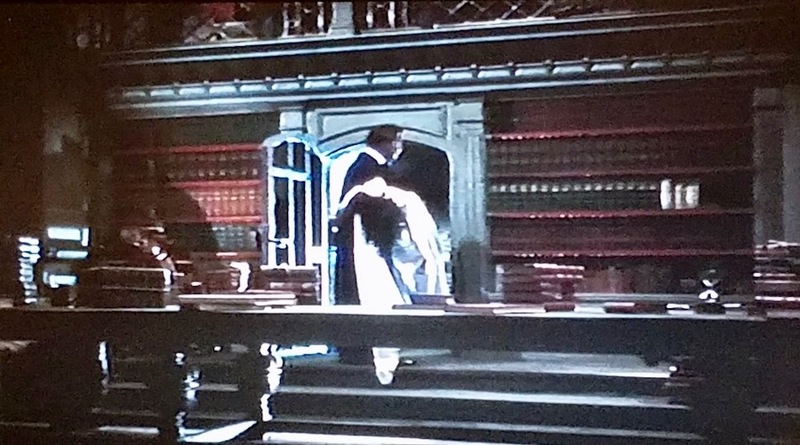 Harker attempts to stop Dracula from hurting the woman, but Dracula pushes him away and then grabs his bride and takes her through the door in the library. There’s a shortcut tunnel in and out of the library! I have become a victim of Dracula and a woman in his power. It may be that I am doomed to be one of them; if that is so, I can only pray that whoever finds my body will possess the knowledge to do what is necessary, to release my soul. I have lost a day. Soon it will be dark. While my senses are still my own, I must do what I set out to do. I must find the resting place of Dracula and there, end his existence forever. He then hides his diary in a boulder outside the house. This detail will be important later! 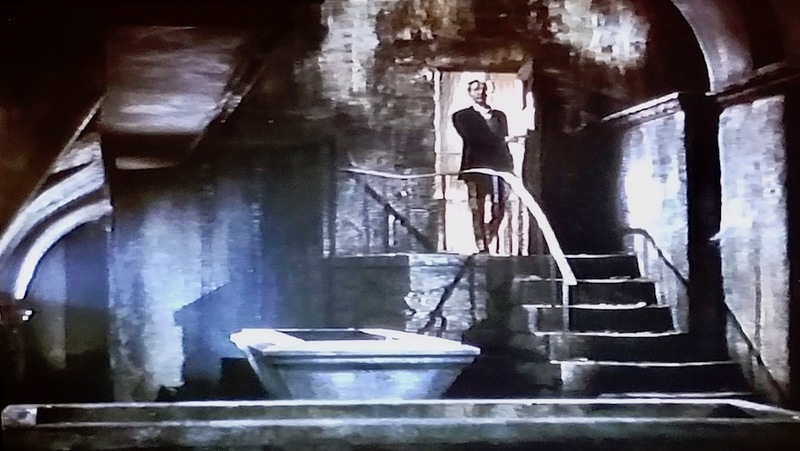 Harker then discovers a door to an underground lair, where he finds caskets for both Dracula and his bride. He has a wooden stake and hammer, yet his instincts are not as sharp as his stake. Instead of fulfilling his stated mission — “I will forever end this man’s reign of terror” — he starts by staking the woman. Dracula wakes up, and OF COURSE night then falls, right on cue. 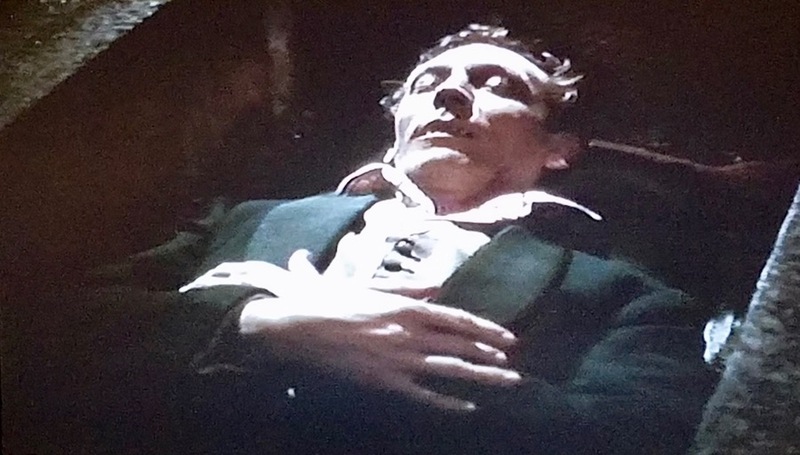 Harker’s brain starts to work again, as he realizes the mistake he’s made when he finds Dracula’s casket empty. But it’s too late, and it’s (literally) lights out for Harker. But never fear, at least ONE book doesn’t get forgotten — Harker’s diary! The next scene takes us into the village, where Dr. Van Helsing, played by top-billed Peter Cushing, enters a local inn. Van Helsing starts immediately asking questions about his friend, but the innkeeper is reticent to tell him any information. Inga, the innkeeper’s daughter, lets slip, however, that she remembers Harker and a letter he had her post. Do you remember this letter? The innkeeper and Van Helsing continue talking, and Van Helsing reveals more information about why and how he and Harker were working together. Innkeeper: Look, sir, you’re a stranger here in Klausenburg. Some things are best left alone, such as interfering in things which are beyond our powers. Van Helsing: Please don’t misunderstand me. This is more than a superstition, I know. The danger is very real. If the investigation that Mr. Harker and I are engaged upon is successful, then not only you, but the whole world will benefit. 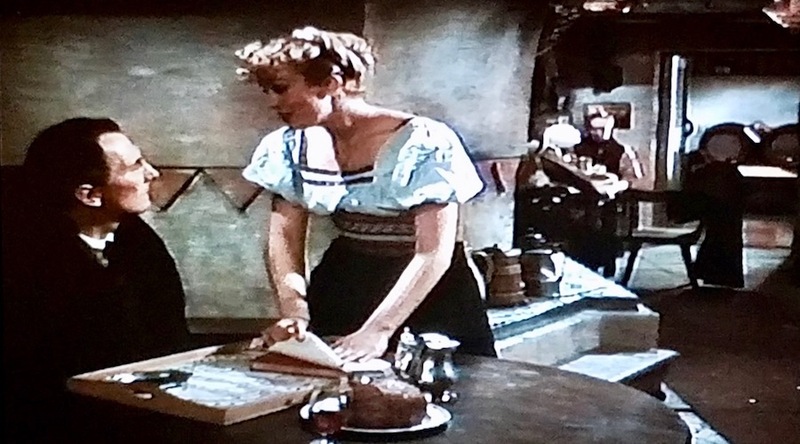 The innkeeper’s daughter then comes back to serve Van Helsing dinner, with a little extra on the side. Have you seen this diary? Inga: This was found at the crossroads near that place. He told me to burn it. But your friend was such a nice gentleman, I couldn’t. 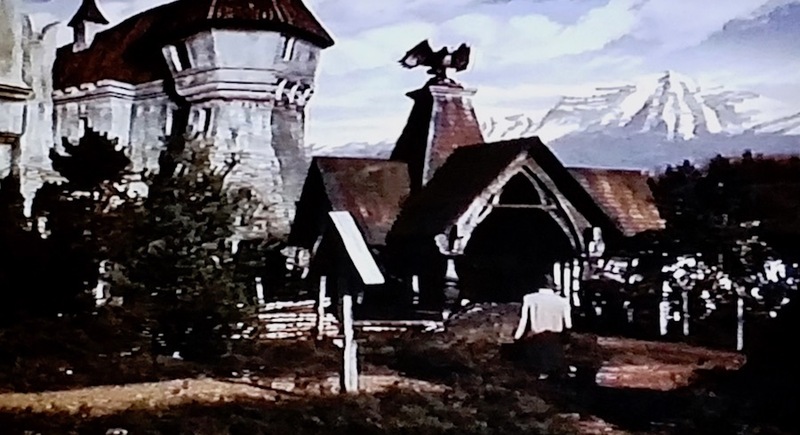 This then leads Van Helsing to Dracula’s castle, where he finds the underground lair… and his friend, Harker. 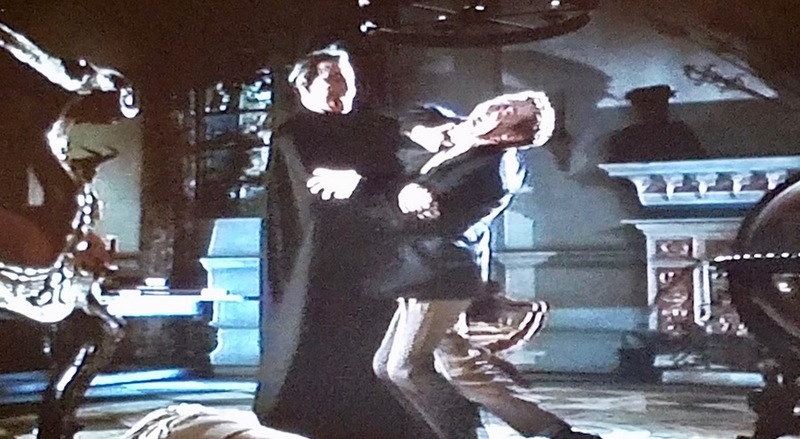 As a distraught Van Helsing takes up the stake and hammer Harker had left on the floor, the camera fades. The next scene reveals Van Helsing informing Arthur Holmwood and his wife, Mina, about Harker’s death. In this film, Arthur is the brother of Lucy, Harker’s fiancée. 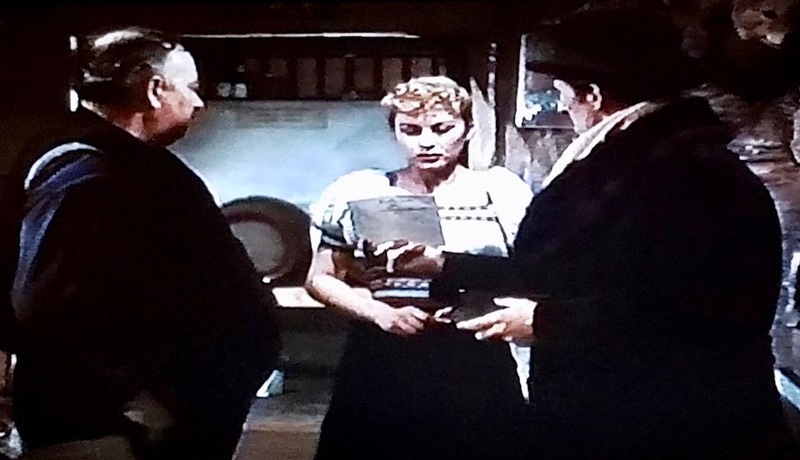 In this short scene, when learn that Arthur is suspicious of Harker’s death; that Harker died 10 days ago; that Harker was cremated (“As his friend and colleague, he told me some time ago that he would wish it“); that Arthur and his wife will tell Lucy the news; and that Lucy is ill. This film is certainly efficient in its storytelling, isn’t it?! 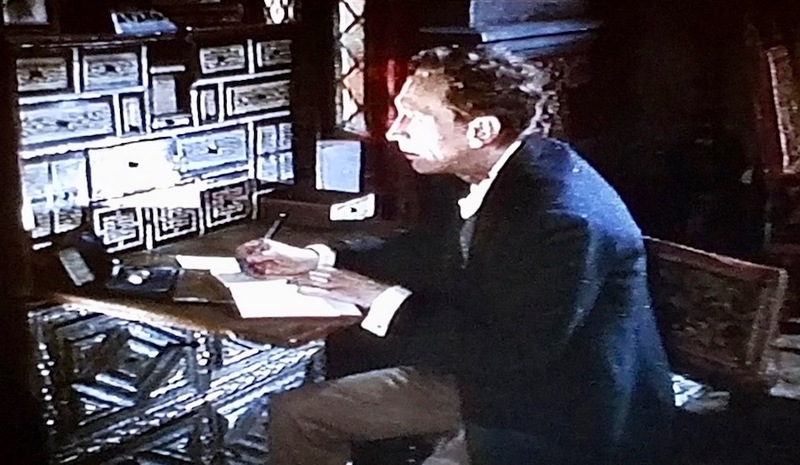 Thirty-five minutes into the film, Van Helsing reviews Harker’s diary while a recording plays on a gramophone. The recording is Van Helsing’s own voice, detailing the dangers and signs of vampires. Again, a clever way to include a lot of expository details in a short amount of time! Since the death of Jonathan Harker, Count Dracula, the propagator of this unspeakable evil, has disappeared. He must be found and destroyed. So although Harker is no longer physically part of the film, he and his diary remain central to the film and propel the plot forward. This time, it’s personal! I cannot expect you to believe me, but you will I know believe Jonathan. Here are his last words, his diary. When you have read it, you will understand. 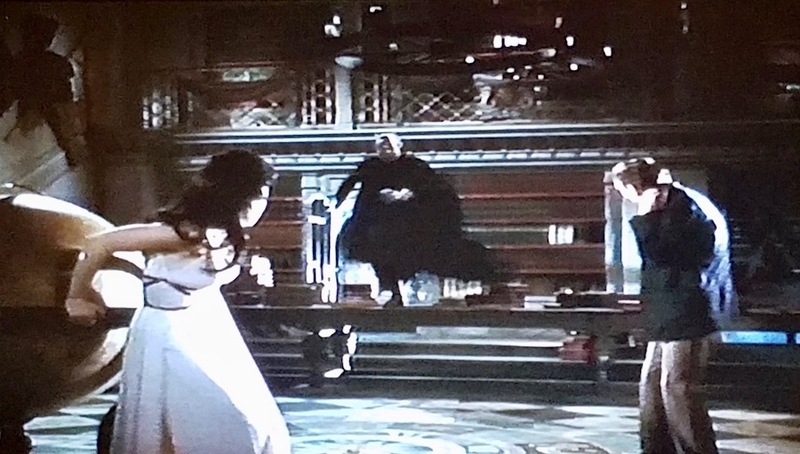 The final scene and showdown between Van Helsing and Dracula occurs five minutes before the end of the film. As Van Helsing follows Dracula to this castle, they meet up in the library — where else?! — and Van Helsing spies sunlight peeking in through the heavy curtains at one end of a large table scattered with piles of books. Van Helsing dashes across the table and throws upon the curtains. Van Helsing leaps back upon the table — scattering books in his wake, and the librarian in me could not help but exclaim, “Don’t take it out on the books!” — and grabs candlesticks to form a cross and force Dracula into the sunlight. Dracula then starts crumbling to ash in the sunlight. Final showdown in the library — don’t take it out on the books! 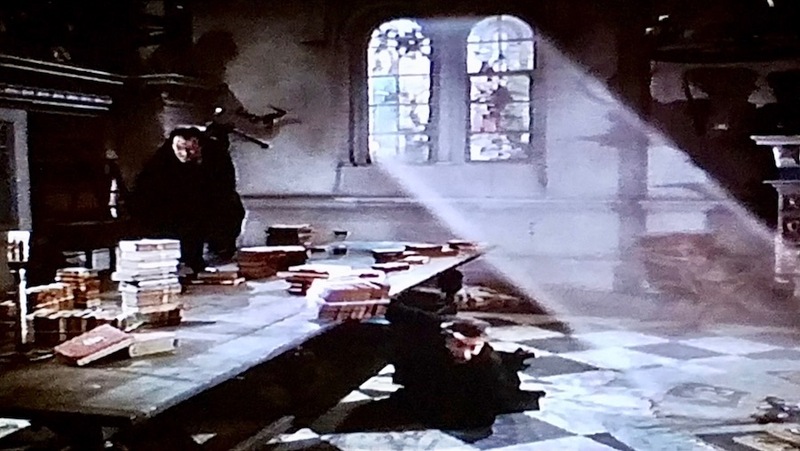 Harker is clearly posing as a librarian, as the line in the opening sequence that Dracula “accepts [Harker] as a man who has agreed to work among his books, as [Harker] intended” reveals. However, it does stand to reason that Harker is a scholar of some merit. It would be too easy to check otherwise, especially as the action takes place in such a limited geographic area. And Van Helsing is a scientist, so it is plausible that he and Harker met because of common scientific, or psychiatric, interests. The idea that Jonathan is a scholar does, theoretically, provide some kind of plausibility about him being able to pass himself off as a librarian — or rather a freelance kind of indexer or cataloger — for Count Dracula’s private library. 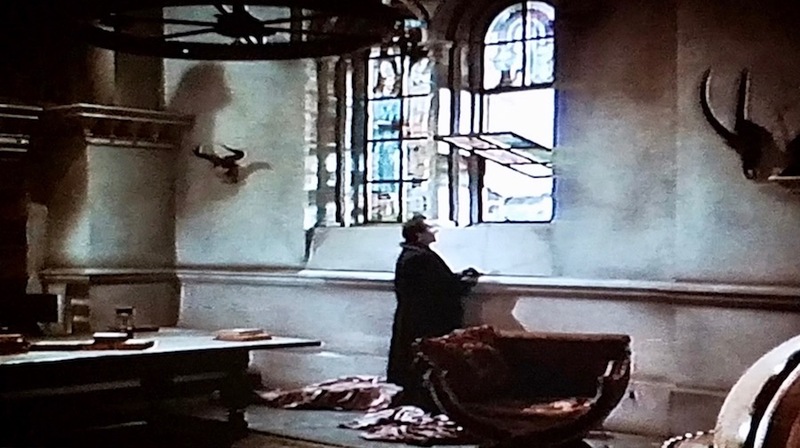 I also wonder if the screenwriter, Jimmy Sangster, chose “librarian” for Harker’s reason for being at Dracula’s castle (rather than as a solicitor arranging real estate transactions for Dracula, as in the source novel) as a way for Harker to throw Dracula off the scent; i.e. that posing as a librarian would not arouse suspicion in Dracula, as librarians are generally (and stereotypically) mild-mannered. Of course, that reasoning only works when Harker goes in knowing about Dracula to begin with, as is obvious from the beginning narration of this film. Ultimately, although Harker has quite a significant role in this film, his attempts at being a reel librarian really only amount to that of being an Information Provider. 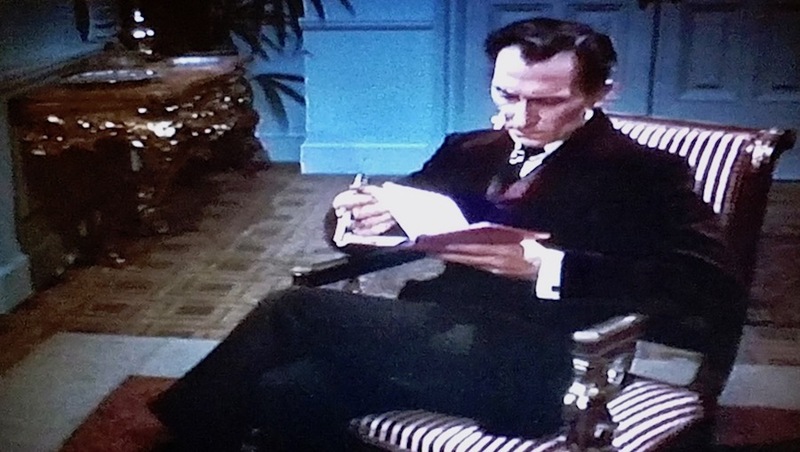 He is there to provide context for thwarting Dracula, and his diary provides clues along the way for Van Helsing, as well as for the audience. 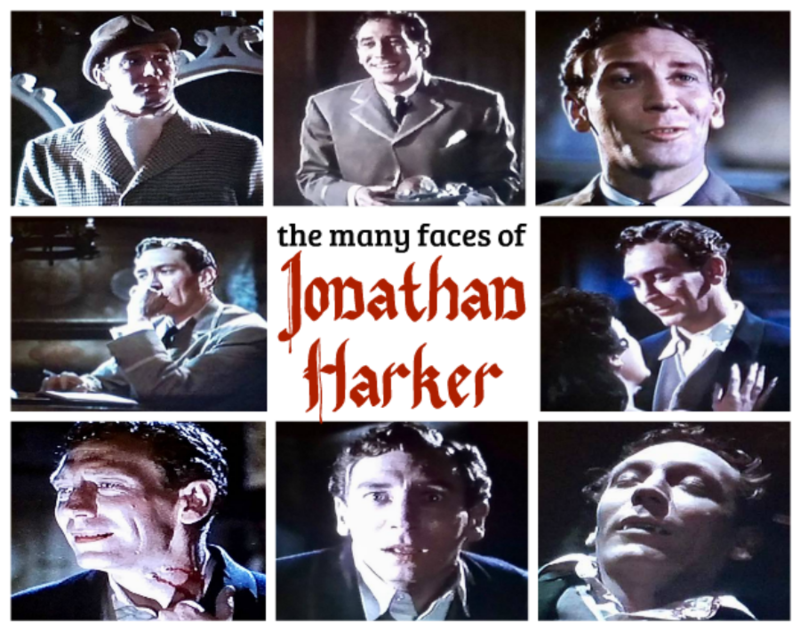 Although we don’t really learn much about Harker on a personal level, I was greatly amused by the variety of facial expressions John Van Eyssen packed into his supporting role. Although Harker’s change of occupation did not get mentioned on the VHS copy I have of this film, I was amused to discover that the first library scene DID make the side cover! 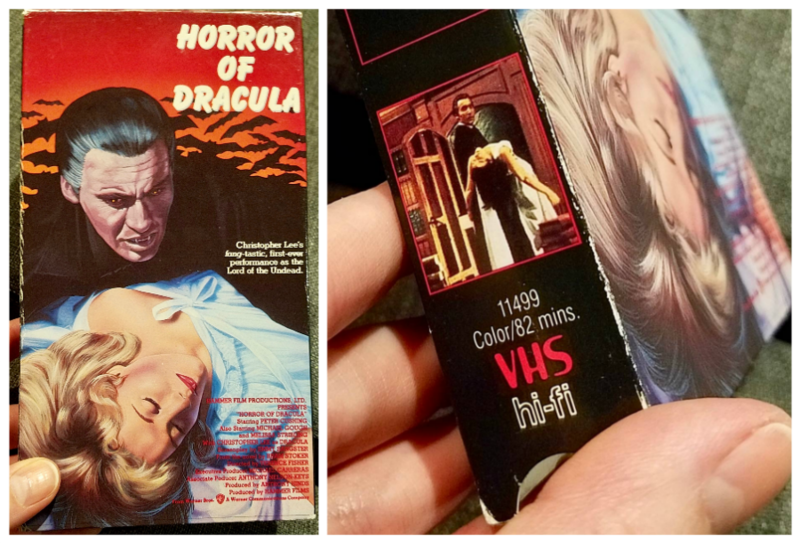 I first saw this film years ago — clearly, when VHS tapes were commonplace! — and I have to admit, that I have found it difficult to classify this film, according to my usual “Reel Substance” categories. I first classified this film under the Class V category, films in which there are no actual librarians, because Harker is posing as a librarian in this film. But that never felt quite right, so I eventually decided to reclassify the film under the Class I category, because the fact that he’s posing as a librarian serves as the catalyst for the rest of the film’s plot as well as Van Helsing’s (re)commitment to destroying Dracula. What are your thoughts on this? I’d love for you to leave a comment and share your thoughts on this or other aspects of Horror of Dracula. And thanks to everyone who voted for Horror of Dracula! It was fun to revisit this horror classic. Horror of Dracula. Dir. Terence Fisher. Perf. Peter Cushing, Christopher Lee, Melissa Stribling, John Van Eyssen. Universal, 1958. “Dracula (1958 film)” via Wikipedia is licensed under a CC BY SA 3.0 license. “Horror of Dracula (1958).” IMDb.com. Accessed 15 October 2018. 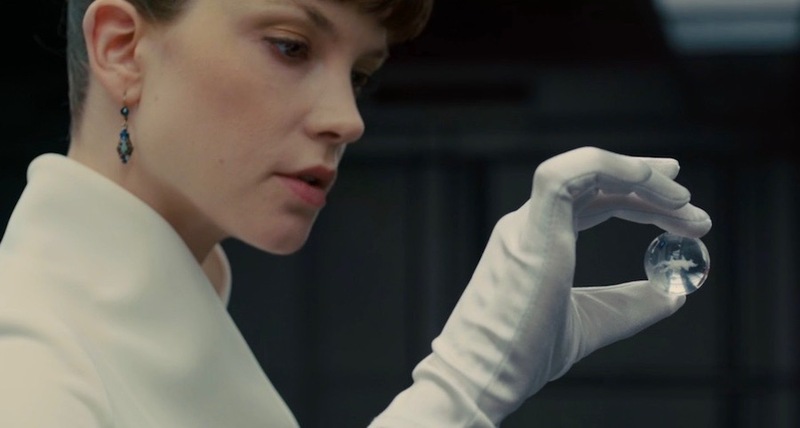 The iconic white glove of the archivist DOES appear in the film — just not on the archivist! My husband alerted me to an extended archives scene in 2017’s Blade Runner 2049, a scene that helps set in motion the background and plot for the film. And it felt like perfect timing, as I recently deep-dived into real-life archivists critically examining portrayals of reel archivists. Let’s dive into this film now! Blade Runner 2049 is not a remake of the 1982 cult classic Blade Runner; rather, it is a continuation, with Harrison Ford reprising his role as Deckard. Ryan Gosling stars as K, a police officer assigned to track down a rogue replicant. He begins by going to the Wallace Corporation’s Earth Headquarter archives. The archives scene begins 30 mins into the film. K stands at a long, wrap-around counter, behind which sits the archivist, played by Icelandic actor Tómas Lemarquis. It’s interesting to note that although this character is titled “File Clerk” in the credits, the subtitles refer to him as “Archivist.” I will refer to this character as the archivist throughout the remainder of this post. K: Just checking in on an old serial number. The archivist reacts swiftly and strongly to the information on the screen. I *loved* the archivist’s facial expressions during this scene. Archivist: Oh! An old one. Pre-blackout. Huh. That’s gonna be tough. Not much from then. And what’s there is [clicks tongue] thick milky. 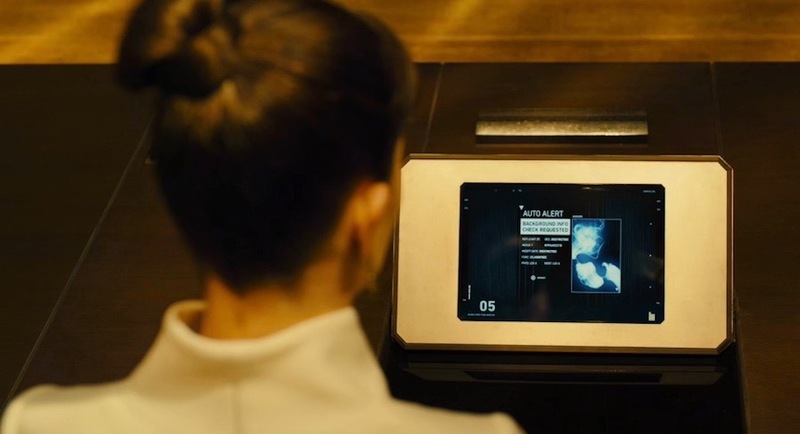 Luv, a replicant who is assistant to Mr. Wallace — remember, they’re at the Wallace Corporation’s Earth Headquarters — then gets an auto alert about the serial number and DNA scan. She asks to reschedule the client meeting she had been conducting. We then cut back to the archivist, who is leading K down rows and rows of what look very similar to old-fashioned card catalog drawers. The cinematography is quite striking in the film in general, but particularly so in these scenes. The atmosphere feels almost holy and reverential, with the rows of card catalogs akin to pews in a church. But instead of feeling warmth or comfort from the reverence, we instead get a feeling of severity and sterility… perhaps because all the pre-Blackout data has been wiped? All of these records are blank, useless, broken. Yet they remain a monument to what was. While they walk, the archivist chatters to K.
Archivist: Everyone remembers where they were at the Blackout. You? K: That was a little before my time. Archivist: Mmmmm… I was home with my folks, then ten days of darkness. Every machine stopped cold. When the lights came back, we were wiped clean. Photos, files, every bit of data… Fttt! Gone. Bank records, too. [Chuckles] Didn’t mind that. It’s funny it’s only paper that lasted. I mean, we had everything on drives. Everything, everything. Huh. My mom still cries over the lost baby pictures. The archivist then opens a drawer and rifles through what looks like plexiglass microfiche, even holding one up to the light. Archivist: Pretty fractured. Not much on it. One of the last gens, pre-Prohibition. Standard issue. Made by Tyrell. Their exchange is then cut short, as Luv appears behind them at the end of the row. The archivist immediately shuts down, and in silence, bows to Luv, walks over, hands her the file, and then walks away. There is no question who holds the power in this scenario. Luv: Another prodigal serial number returns. A 30-year-old open case finally closed. Thank you, officer. I’m here for Mr. Wallace. I’m Luv… Follow me. The ancient models give the entire endeavor a bad name. What a gift, don’t you think, from Mr. Wallace to the world? The outer colonies would never have flourished had he not bought Tyrell, revivified the technology. To say the least of what we do. During this exchange, they walk through another collection of Mr. Wallace’s, a collection of rogue replicants encased in glass. This is the second peek into the Wallace Corporation’s archives, which are eclectic indeed. And not a little creepy. Luv and K then continue down a shadowy corridor, the off-site storage for archives. No longer in the main cathedral of the archives, it’s like they are now walking along the cloisters. Luv: Here. All the junk is in here. Lucky for you, Mr. Wallace is a data hoarder. [the door sticks.] No one’s been down here in ages. [shoves open the door] Sorry about that. The lights automatically come on as they step in the room. Luv: All our memory bearings from the time. They were all damaged in the Blackout. But there are sometimes fragments. The video flashes fragments of an interview between Rachael and Deckard, an interview from the original film. 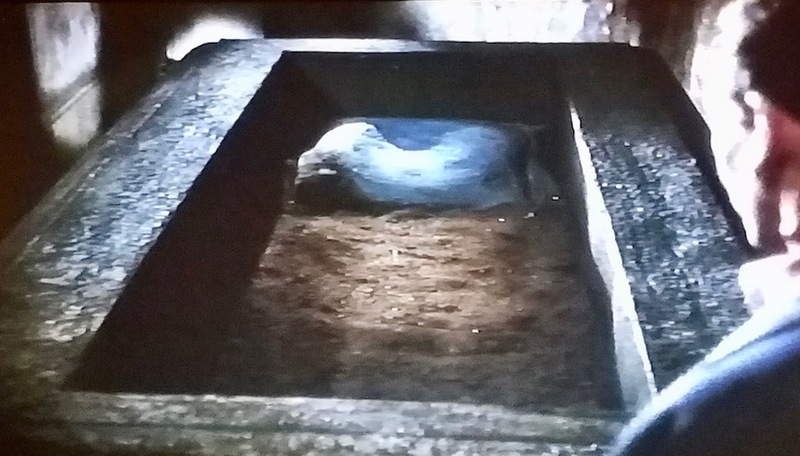 This then sets up the eventual connection between Deckard and K.
The archives scene lasts about seven minutes in total, but sets the rest of the film’s plot in motion. It also emphasizes how vital archives are in society — and how the loss of archives adversely affects a society — as well as how important access is to archives. Librarian: This is embarrassing. It’s embarrassing to misplace things. Librarian: Hmmm, the whole of the 13th century. This is a major theme in the movie, that data is the soul of memory. And with no data or records, what happens to memory? What happens to our souls? 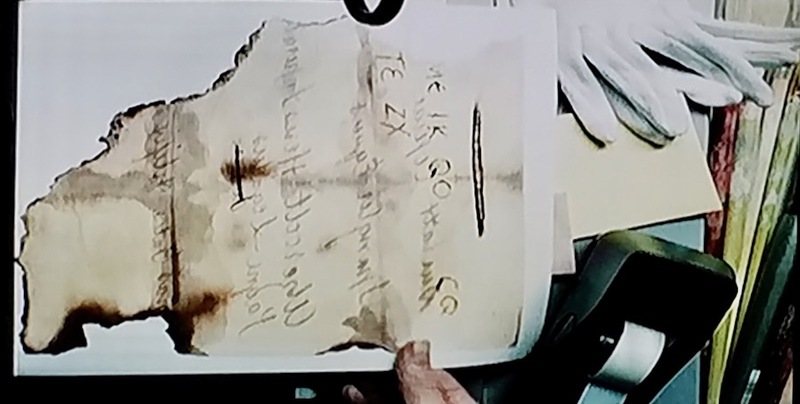 Let’s talk about archives in Blade Runner 2049. There are multiple archives accessed during the film, and *implied* archives that no longer exist. They are all critical to the story. Indeed, the story of archives parallels the story about memory. Before Luv shows up, the archivist smiles quite a bit and infuses his lines with real feeling, as well as making amusing sound effects (like clicking his tongue), and making hand gestures. His vivid personality is notable in a film of blank demeanors and flat line reads from the replicant characters. My hat is off to the actor, Tómas Lemarquis, who makes quite an impression for just a couple of minutes of screen time. Ultimately, the reel archivist in this film winds up in the Information Provider category. And the personality that shines through this reel archivist’s portrayal lands the film in the Class III category, film in which the librarian(s) plays a secondary role, ranging from a supporting character to a minor character with perhaps only a few lines in one memorable or significant scene. 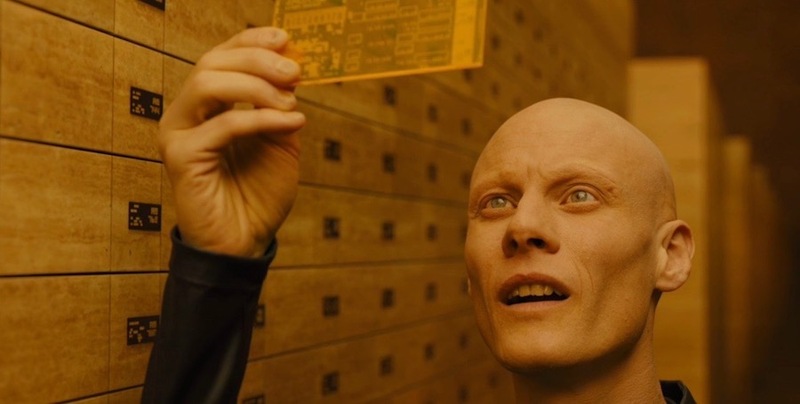 Have you seen Blade Runner, the original or the recent sequel? What are your thoughts about this reel archivist character? Please leave a comment and share! Blade Runner 2049. Dir. Denis Villeneuve. Perf. Ryan Gosling, Harrison Ford, Dave Bautista, Jared Leto. Warner Bros., 2017. “Blade Runner 2049” via Wikipedia is licensed under CC BY SA 4.0. Rollerball. Dir. Norman Jewison. Perf. James Caan, John Houseman, Maud Adams, John Beck. MGM/UA Entertainment, 1975.